instead of pulling hair out and rounded ends that would not scratch your pet¡¯s skin. It is great for deshedding and detangling your dogs and cats. 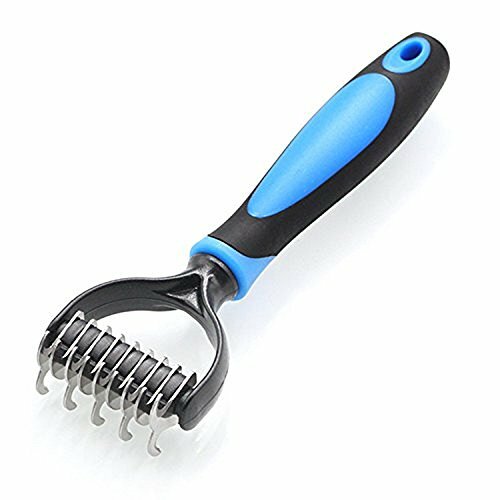 PET DEMATTING COMB: The dematting rake features dual side, the lower density side for matted hair and tangles and the another side is for thinning and deshedding. It gently removes dead undercoat and eliminates tangles, knots and matted hair, greatly remove tangles, knots and mats. DURABLE & ECO-FRIENDLY: This mat comb is made of stainless steel that prevents from rusting and non-toxic material. And the strong handle will last a long time. ERGONOMIC HANDLE: The anti-slip rubber and ergonomic handle is suitable, will give you a comfort-grip. EASY TO CLEAN: The rounded ends of teeth does not hurt your pet¡¯s skin, and it¡¯s easy to clean the fur on it. GREAT GROOMING TOOL: Ideal for large or small cats, dogs and other furry pets, can easily clean your pets on your grooming table or any tables at home! If you have any questions about this product by EasyJoy, contact us by completing and submitting the form below. If you are looking for a specif part number, please include it with your message.